Did I ever write how the Grammy Awards drama turned out? I don't think I did. But anyway, things turned out very well. What happened was, I was dealing with a gal at the Grammys named Pam. She called me about a dozen times. This is a big and complicated deal, choosing a picture for the Grammys. It is not like slapping a picture up on your blog! Once when Pam called me I was in traffic on Delaware Avenue. Normally I would never pick up my cell phone in the car but No. 1, it was about Leonard Pennario, and No. 2, the roads were such a mess that the traffic was not moving anyhow. I was just sitting there. Remember that snowy day last week when it took everyone an hour to get home? That was the day I was talking to the Grammys. We get so tough in Buffalo. Here you are in the car in a snowstorm, and you use the time to get work done. That evening, Pam and I narrowed the selection of photos to three. She had to take these pictures to a meeting of the producers. I loved to picture that scene. I imagined a whole boardroom full of people, all poring over pictures of Leonard Pennario. I wish I could have been there to see that! I am pretty sure the picture above was one of the ones they considered. But they ultimately chose a picture of Pennario that I had tagged, way back when I was in California with Pennario, "LP in the woodshed." That was because he looked as if he were working hard. Which, Pennario very rarely looked as if he were working hard. There is one picture I have of him playing volleyball on the beach. That is more like it. I challenge you to find a picture of Vladimir Horowitz playing volleyball on the beach. 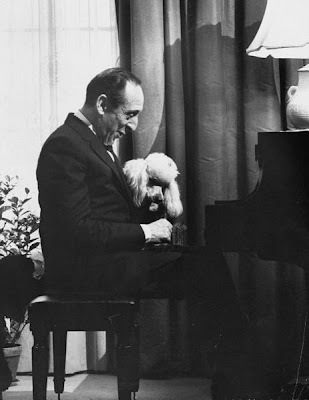 On the other hand Horowitz did let a poodle sit with him at the piano. Wow, there is so much stuff about Horowitz on the Internet I am just falling over it. He is so chronicled! Not like Pennario, I will say that. Pennario is a pianist of mystery! Let me tell you about the picture the Grammy people liked, "LP in the woodshed." 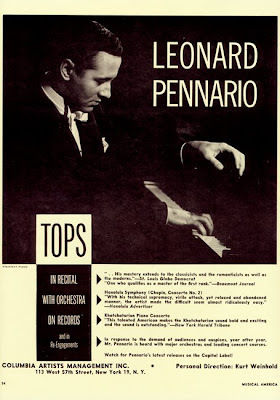 The lighting is beautiful and the picture shows Pennario maybe in his 30s, sitting at a Steinway. His chin is in his left hand and he has a pencil in his right hand, and he is studying a score with kind of a dreamy look. I wish I could run the picture here but I do not think I should scoop the Grammys. Plus, I want everyone to tune in! One thing I liked about Grammy Pam is that she was swooning over Pennario's pictures. Ha, ha! I do that! She was looking at "LP in the woodshed" and describing why they liked it and all of a sudden she stopped. "Oh, my God," she said. "Oh, my God, just look at him." I said, "Yes, it's a pleasure to be writing a book about such a handsome man."